All right gamblers, I’m back! Busy weekend this week for boxing fans. Showtime and HBO will both be televising fights, so polish up your channel clicker skills, because between rounds you’re going to need to watch two fights at once! We’ll start with Showtime in the featherweight division. 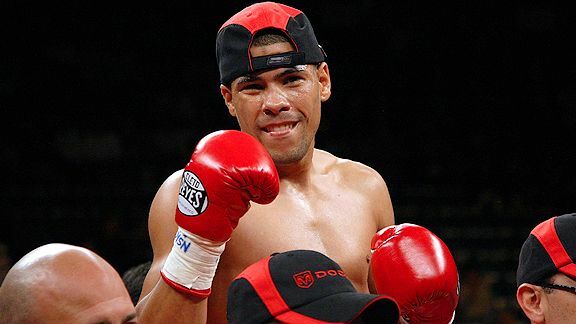 JuanMa is one of the most entertaining fighters in the world. He brings solid power, and also shows a bit of vulnerability, making him that much more exciting. Salido on the other hand, had some success against Yuriorkis Gamboa and is a tough customer. But, despite only being 30, it seems that the Mexican had his best years in his mid 20’s. In short, there’s a lot of miles on him and although I imagine him putting up a tough fight, expect him to succumb to Lopez’ pressure and accuracy in the later part of the fight. While Andre Berto is still undefeated, he is still relatively untested against the top welterweights in the world. Last year, he was to fight Shane Mosley and perhaps that fight would’ve provided us with an answer to the question, of where Berto belongs not only in the welterweight division but also if he belongs with boxing’s elite. Unfortunately, Berto had to pull out and fly out on a humanitarian mission to Haiti because of the devastating earthquake. Although he is fighting a good fighter in Victor Ortiz, he’s fighting a guy who has been knocked out the only time he was tested, and has also shown mental fragility in recent fights. When the going got tough against Maidana, Ortiz decided to call it a night. In his last fight, Ortiz knocked Lamont Peterson down twice, but then coasted, allowing the Washington native to get back in the fight. Although the result of that fight was a draw, and most people thought Ortiz won, it did leave a sour taste in the mouth of the boxing public. What could’ve been a great performance, turned into a satisfactory one. Both fighters have had the same problem in recent years. They’ve always left more to be desired. That being said, Berto is the natural welterweight and bigger man and also has the advantages with his boxing skill. He also brings the power, and has shown heart in the pass. That should allow him to take Ortiz out, somewhere around the 8th round. Amir Khan is scheduled to take on fellow top light welterweight Timothy Bradley in July of this year, providing that he beat Paul McCloskey. McCloskey is undefeated, but is a ripe 31 and has mostly fought on the domestic circuit. The advantage that the young Irishman has is that he’s a southpaw. That being said, Khan trains with arguably the best southpaw in the business (I’m sure you know who I’m talking about, but if not - Manny Pacquiao), and should have no trouble beating the Irishman. Khan has struggled a bit with guys with pop, but it will be interesting to see if there’s a difference, if any, without Alex Ariza in Khan’s camp. Regardless though, if Khan is taking his opponent seriously, then he should walk away with a stoppage win, somewhere in the middle rounds. I expect McCloskey to be tough, but a bit out of his league.